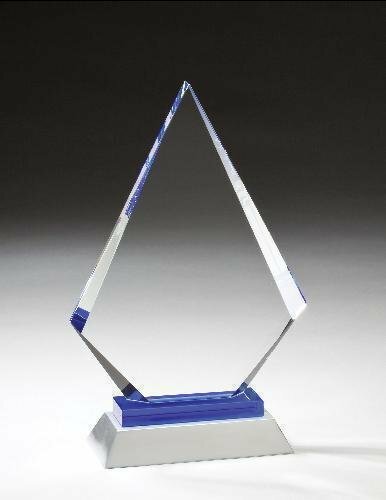 These Glass Awards are packaged in beige laminated gift boxes. 3/8" thick glass, suitable for laser engraving or sandblasting. All Glass Awards are preassembled, bases have protective velour bottoms. Clear Optical Crystal and Green Marble Arch Top award packed in an elegant gift box. Base Measures 5 x 7 x 1/2"
The Arrow Point diamond award is a sleek, elegant design which exemplifies its ability to be one our most versatile awards. This product provides plenty of room for custom laser engraving, Color printing or both! Available in three sizes. Base included. 3-1/2" wide x 9-1/2" tall x 1" thick. 4-1/4" wide x 11-1/4" tall x 1" thick. 5" wide x 13" tall x 1" thick. Optical Crystal Diamond Arrowhead Award. This item comes packed in an elegant black gift box.